In June of 2014 (or maybe it was July, I don’t really remember), I had decided to start planning my novel for NaNoWriMo ’14, and so I gathered up a plot bunny I’d had a while back, combined it with a different idea, and started developing it. When NaNo came around, I had semi-developed characters, the vaguest hint of a world, a bit of a beginning, and zero plot. When November ended, I had 100k of flat characters, broken plot, and non-existent world building. It was awesome. Staring 2015, I started editing. And world building. And…more world building. And…oh yeah, I did world building, did I mention that part yet? Plus some world building. And then when I thought maybe I’d done enough of world building, I edited some more. I finished draft two on Halloween. Then for NaNoWriMo ’15, I wrote assorted scenes for the sequels. By the time this November ended, I decided I was sick of this world, this story, these characters. Don’t get me wrong. I adore them. I love working with these ones, and even though draft three is going to be a huge, time-consuming process that will probably take almost as long as draft two did (which was ten months, roughly…maybe nine, because I don’t remember if I started in January or February), I am so looking forward to it. But first, I really would like to explore a different story. Something totally new, totally different, totally unrelated. And that’s what I’m doing now! I discovered recently that I’m actually more of an outliner than a discovery writer, so the first step was to, well, plan. This is how I planned. That is my bedroom wall. The bottom right corner is a timeline. The story is set in America at 2137AD, so I wanted to figure out some of the important things that happened between now and then. Like world war three. It’s not very detailed, and I probably don’t have as much information as I could have, but it works for now. The other white papers were originally a to-do list for what I needed for world building and stuff. On the left is world building, and the purple sticky notes taped there are related to world building. I assigned each sticky note to a particular part of it. (I tried to write small, and I didn’t get very detailed, so yeah, only one sticky note for each thing.) In the middle is character related stuffs. Personality, backstories, and other stuff. (Strangely enough, I never actually figured out what my characters look like.) The right ones are just random things I wanted to make sure I figured out. Below that is my outline. At the bottom of the white pieces of paper, I noted parts of the Three Act Structure, and then way below that, the salmon-pink pieces of paper are character arc events relating to the three act structure that I recently learned about in this cool post. 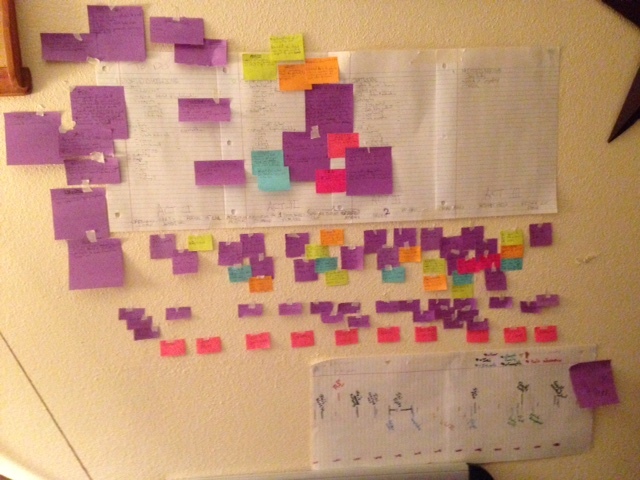 In between those, the purple sticky notes are events relating to the plot, while the other colors are each associated with a character, and so the events written on those are related to that particular character. I don’t know if any of that makes any sense to anybody besides myself, but that’s what I have. I considered a few months ago trying to get Aeon Timeline because it sounds awesome and it syncs with Scrivener, but then there was just too much to put in when I messed with the trial. I think I like this, though. Sticky notes on my wall. The only downfall is I think I’m going to run out of sticky notes. That’s basically the extent of my prewriting. I rambled a bunch at my other writing friends, especially about the worldbuilding, but then as soon as I figured it out, I wrote a condensed, focused version on a sticky note and taped it to the wall. Also, fun fact: sticky notes don’t seem to stick to the wall very well. So I had to use my masking tape. So that’s what I’ve got. How do the rest of you prefer to keep track of your prewriting and notes? Wow! I’ve heard of other writers using similar “visual” outlining methods with sticky notes, index cards, timelines, etc. How are you finding it so far? Or are you still in the middle of pre-writing? I’m actually writing chapter two right now, which is still too early on in the story (I haven’t even truly reached the “inciting incident” part of the story) for me to really tell how well it’s working/going to work. But if nothing else, I really enjoyed planning it this way, so I think it’ll at least be a success in that regard. That sounds good. Heheh, yeah, I think you never do stop learning about them, even if the story is finished. It’s funny how that works. No problem! I like sharing links I found useful. Thanks for commenting! Definitely. Actually, now that I think about it, my first chapter seems to be a stronger beginning than it usually is when I don’t plan a project as well.